Perfect laundry has never been easier. Introducing the NEWEST additions to the Miele W1 washing machine and T1 dryer line-up. Our classic models (WWB020 WCS and TWB120 WP) will be debuting in 2019. Quality you can see, feel and taste. Discover cooling products engineered to keep each piece of food as fresh as possible – down to the exact, optimized degree. 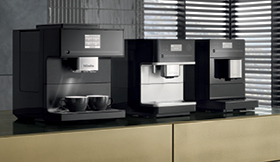 Explore Miele’s latest countertop coffee machines with options to suit all tastes at the touch of a button. 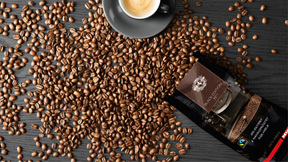 Only when high-quality coffee machines interact precisely with premium coffee beans can you achieve the perfect cup of coffee. Gets going when you do. 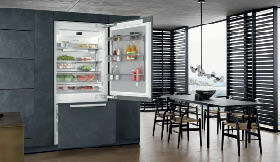 Introducing Miele's next generation of robot vacuums, featuring Mobile Control and Quattro Cleaning Power. 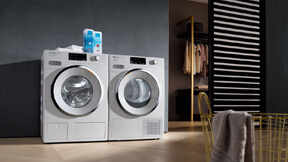 Discover Miele's newly introduced laundry assortment including the W1 washing machine and T1 dryer.